Choose Your Own Adventure/Destiny stories are making a comeback, and they’ve had a makeover. What has remained the same is that they are told in second person, in the ‘you’ voice. The Irish ‘you’ in Break Your Chains is never given a name although all the other characters are identified. It’s 1820s England and you live in poverty in London after fleeing Ireland. Your father has been taken away and your mother has succumbed to illness. Your survival relies on you making the right decisions, because luck is in short supply. The wrong decision may cost you your life. The reader becomes the ‘you’ and must decide which path to follow. Will you give in to the demands of Nell and lose your only item of value, or will you deny her and take your own chances? Will your actions see you transported to Australia or will you perish in an English jail? ‘Break Your Chains’ offers multiple directions for the reader to follow. Some lead to death or misadventure. While the aim is to stay alive, alternative paths paint a picture of real life in England and in Australia in the early 1800s. 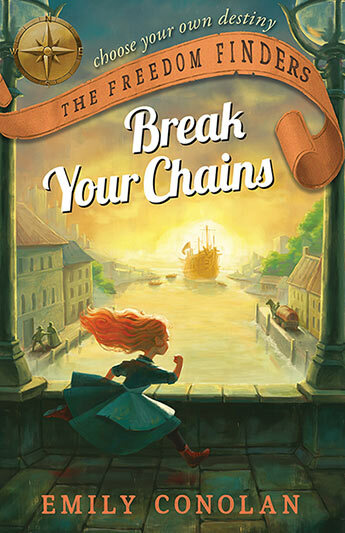 ‘Break Your Chains’ gives young readers an opportunity to not only choose their own path, but to understand the consequences for choosing the wrong way. A cleverly constructed story for both lovers of history and for reluctant readers. Recommended for mid-primary readers.